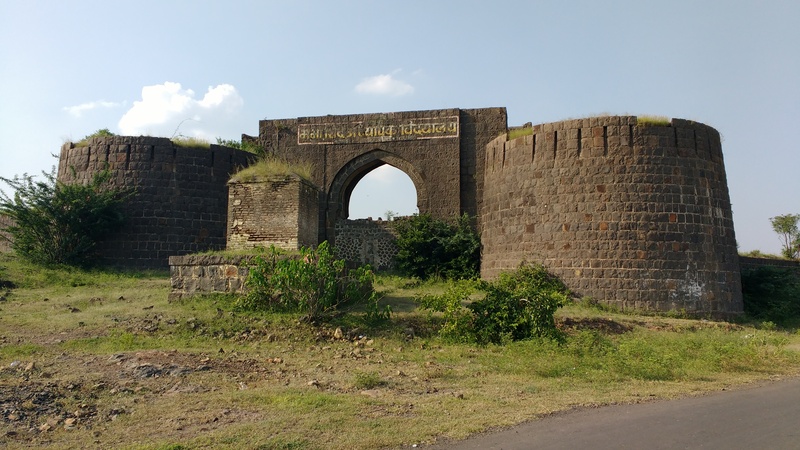 This land fort is in the Parner taluka of Ahmednagar district. In the residence on Mahadji Shinde inside the fort, a college has been established for D.Ed. education and thus the fort is under their control. Of the four doors, only one door is open for access and as the fort now hosts a college inside it can be visited only during holidays. With one�s own vehicle the land fort, Siddheshwar temple in Parner (12 kms) and the nearby region can be visited in one day. Apart from these, the Hindu Brahmani caves of Talki Dhokeshwar at 32 kms and further 25 kms for Palshi land fort and Vitthal temple can be visited. This fort has the background landscape of a small hill and its fortified wall stand s to both the hill ends. No signs are visible for the security and protection of the hill though. The fortified wall which is spread across 83 acres has 20 bastions. A door of this fort stands in front of the Malganga temple on Jamgaon-Parner road. Two bastions and fortification wall besides this door are still in good condition. Proceeding further by this door there is an eastward facing door and a temple of Lord hanuman across the street opposite to it. There is a dual fortification when we enter the fort form here whereby we come across the residence mansion of Mahadji Shinde. Take the left from here to reach a temple of Lord Ram traced back to the Peshwa era and a temple of Lord Hanuman in front of it. There is another temple of Vitthal Rakhumai. Few yards from here towards the backside there is a main door of the fort which is closed now. While proceeding back towards the mansion we can see the remnants of many structures which were the houses in the ancient era as the Jamgaon village was nested inside the fort premises. Later as the population increased, people moved out. There is a Mosque with three arcs on the way to the right and a dilapidated brick structure to the left. A strong fortification can be seen as we move ahead. To protect the mansion is has been secured by dual fortified wall. Crossing this wall we come across a small door. This fortification wall has six bastions. After entering from the door there is a horse stable to the left and eight stairs in front which gives access in the front of the mansion. There is a huge well in front of the two storied mansion. The college authority which runs in this mansion has made some structural changes to this mansion. There are small porches in the mansion walls. The whole fort can be visited in 30 minutes time. On Kalyan-Nagar route, a road from Takli Dhokeshwar village (33 kms) goes to Parner from where Jamgaon fort is at 12 kms. Kalyan to Jamgaon fort distance is about 203 kms on the Parner-Jamgaon road.